I have some great showers in my time. It would be indiscreet to go into details but today’s shower, my first at the Greek hovel was right up there with the best. Not that I was accompanied by anyone it was just great to feel clean again. It is not a luxury power shower. 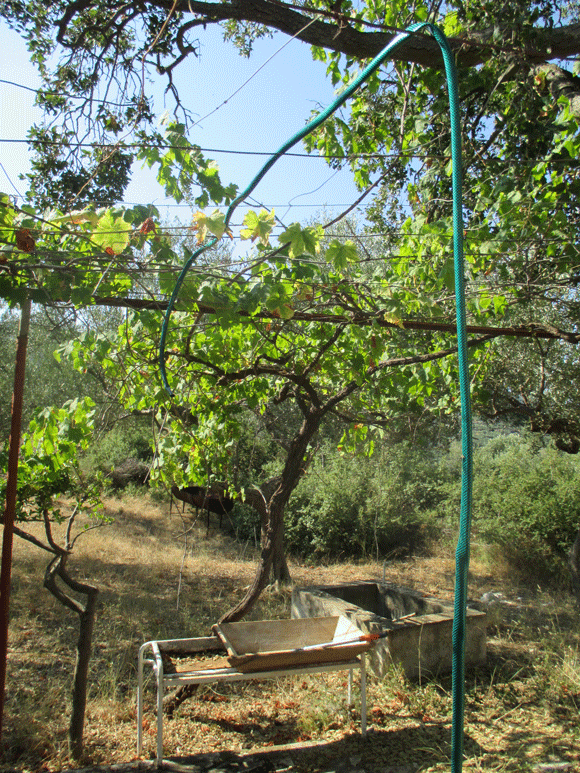 I merely linked up a hosepipe I bought to one Foti had left and loped it through the trellis for the vine on the snake patio and turned the water on. The water is fresh and clean and felt a lot warmer than that in my early morning sea dip a couple of days ago. It was a joy for my body to meet soap again and to emerge with clean hair. Afterwards I just sat in the sun to dry off. In case you are wondering though there is no-one around modesty was preserved with my, increasingly less tight swimming trunks. I may build a screen in due course once I have completed more urgent tasks relating to reducing local wildlife diversity.